Guest Blogger Jenny Crittenden, executive director of Gloucester Main Street Preservation Trust, started with Main Street in 2006. Her leadership has inspired key partnerships and implementable growth strategies for Gloucester Village, including the creation of façade and interior improvement grant programs and an annual symphony concert that brings over 2,000 visitors to downtown. As we enter the holiday season and everyone is spreading cheer….here in Gloucester we’re thinking beer! Over the last few years, I’ve attended National Main Street Conferences and been fascinated with the concept of crowdfunding a project. The nationally-utilized platform ties together a community in a way that a traditional approach to project funding does not. We now have the crazy opportunity, through a national competition, to crowdfund a BrewDog brew pub – a whole new amenity to our rural community! We are always thinking big and there’s nothing we aren’t willing to tackle; including competing on the level of cities such as Houston, San Diego, New York City, or Chicago. BrewDog is an irreverent Scottish craft brewer that loves American brew pubs and will be embracing these beacons of beery enlightenment by launching their very own in the United States. They currently operate more than 46 BrewDog bars globally, from Tokyo to Barcelona, and now they are bringing the very first BrewDog venues stateside as part of the Equity for Punks USA campaign! Why not Gloucester? Exactly…why not? Smaller communities can rally fast, build a grassroots effort, and get buy-in, not just financially, but that entire community-emotional-buy-in. It’s what makes a small downtown so special. We may not yet be on the leaderboard, a map that tracks the cities in the contest, but we have BrewDog’s attention. BrewDog executives have seen our press release in the local newspapers and are watching our Facebook page, seeing that over 1,000 people are talking about the competition. 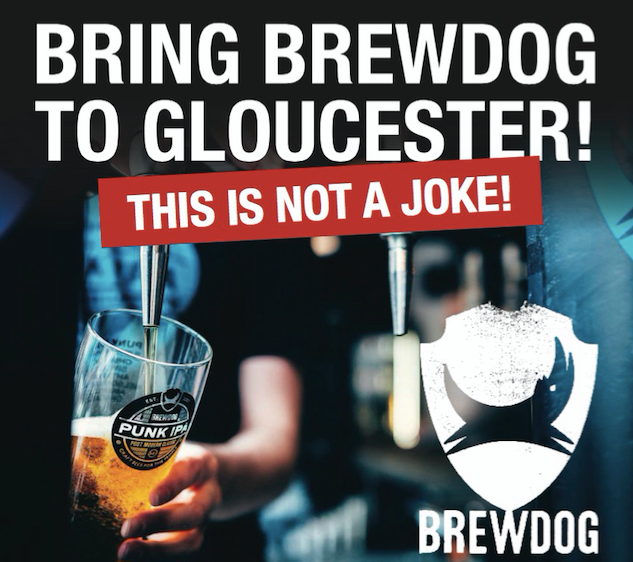 They even agreed to send a BrewDog representative and personal video message to Gloucester for our upcoming public meeting, for which we flew in beer from Scotland for tasting. On site we will have laptops and tablets for on-the-spot investment. We aim to take the leaderboard by storm! If 500 people invest in BrewDog USA from GLOUCESTER, VIRGINIA, and our local partners, they will open a brew pub HERE! Minimum investment is only $95.